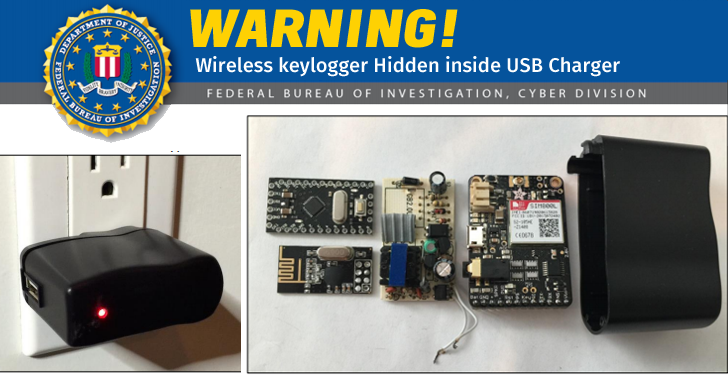 Last year, a white hat hacker developed a cheap Arduino-based device that looked and functioned just like a generic USB mobile charger, but covertly logged, decrypted and reported back all keystrokes from Microsoft wireless keyboards. Dubbed KeySweeper, the device included a web-based tool for live keystroke monitoring and was capable of sending SMS alerts for typed keystrokes, usernames, or URLs, and work even after the nasty device is unplugged because of its built-in rechargeable battery. Besides the proof-of-concept attack platform, security researcher Samy Kamkar, who created KeySweeper, also released instructions on how to build your own USB wall charger. Now, it seems like hackers and criminal minds find this idea smart. The FBI has issued a warning advisory for private industry partners to look out for highly stealthy keyloggers that quietly sniff passwords and other input data from wireless keyboards. Since KeySweeper looks almost identical to USB phone chargers that are ubiquitous in homes and offices, it lowers the chances of discovering the sniffing device by a target. However, according to a Microsoft spokesperson, customers using Microsoft Bluetooth-enabled keyboards are protected against KeySweeper threat. Also, its wireless keyboards manufactured after 2011 are also protected, as they use the Advanced Encryption Standard (AES) encryption technology. So, the primary method of defense is either to restrict the use of wireless keyboards, or to use keyboards that use the Advanced Encryption Standard (AES) encryption technology. Although the FBI made no mention of malicious KeySweeper sniffers being found in the wild, the advisory indicates the information about the KeySweeper threat was obtained through an undescribed "investigation." "The primary method of defense is for corporations to restrict the use of wireless keyboards. Since the KeySweeper requires over-the-air transmission, a wired keyboard will be safe from this type of attack." FBI advised. Sniffers work against wireless devices that do not use secure encryption for the data transmitted between a keyboard and the computer.